All my doubts and questions regarding bringing Oil Yoga practice to the world has been answered clearly. It has been few years I was eagerly waiting to share this knowledge with the world. 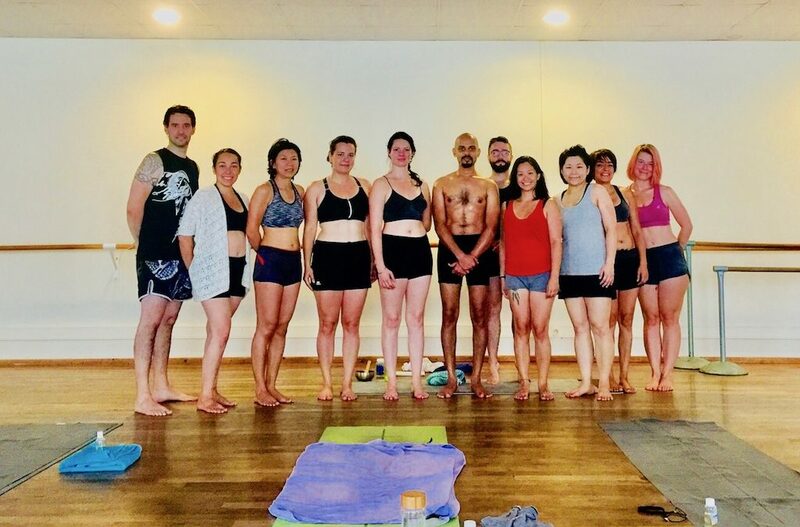 First ever Oil Yoga workshop conducted in the beautiful city of Paris from 17th to 22nd of August 2018. Totally there were 27 participants and 12 of them registered for whole 6 days workshop. I have got wonderful feedback from the participants and which is leading me to dedicate myself to explore and teach many dimensions of Oil Yoga. Most of the workshop participants are coming to Goa to have further studies in Oil Yoga. I had doubt about self-application of oil. I thought people will not like to apply oil on body. But all of the students were happy to learn the art of self-massage with oil. They enjoyed 15 minutes of Abhyanga before commencing asana practice. They appreciated and enjoyed the experience of systematic application of oil on the body. Does mat will be slippery? Even though we hold the final position of the asana for 7 breaths in final position and use jump back and jump front, palms or feet were not slippery. Students were enjoying the whole sequence and process of the practice. Practitioner need to have a good sweat mat which will be useful for oil yoga practice. Will Oil stick on the body? This was a big challenge in for me. As practitioner in the cities have to go for work after the practice, I thought it will difficult if they don’t take the shower after the practice. But oil doesn’t stay on the body after wiping with the towel. Most of the practitioner in Paris went to day today activities without having any problem after the practice. There are enormous benefits of practicing Oil Yoga. As this style is getting in to the main stream in to the Yoga field, there are wonderful opportunities to learn and teach. i am regularly conducting Oil yoga classes in Goa. It is my great pleasure to invite you to discover Oil Yoga. See you in Patnem, South Goa.